I searched the web and to be honest I didn’t find a universally accepted definition of these terms. And like all areas of marketing communications – especially since the digital world arrived – there is a lot of overlapping and blurring of marketing terminology and strategies. This creates a dilemma for marketers when choosing an agency, as many agencies claim to create brand experiences. But some types of experiences require a great deal of specific expertise to conceive and execute, and others require less. So, through this article, I will try to establish a common understanding of these tools, how and when they can be used effectively, and who might be best suited to engage for a given brand experience. Brand Experience is a wide range of activities that take place in the physical and digital worlds that could accurately be described as brand experiences, including experiential happenings, corporate events or employee/consumer interactions in-store or via phone. Usually the combination of all offers a meaningful experience that can increase a person’s brand connection. Specifically, if advertising is intended to create brand awareness, build image or communicate a certain message, successful brand experiences deliver proof of a brand’s promise / benefits / service. Effective brand experiences are designed to create specific, valuable interactions between brands and products / services and the people that matter most to them. 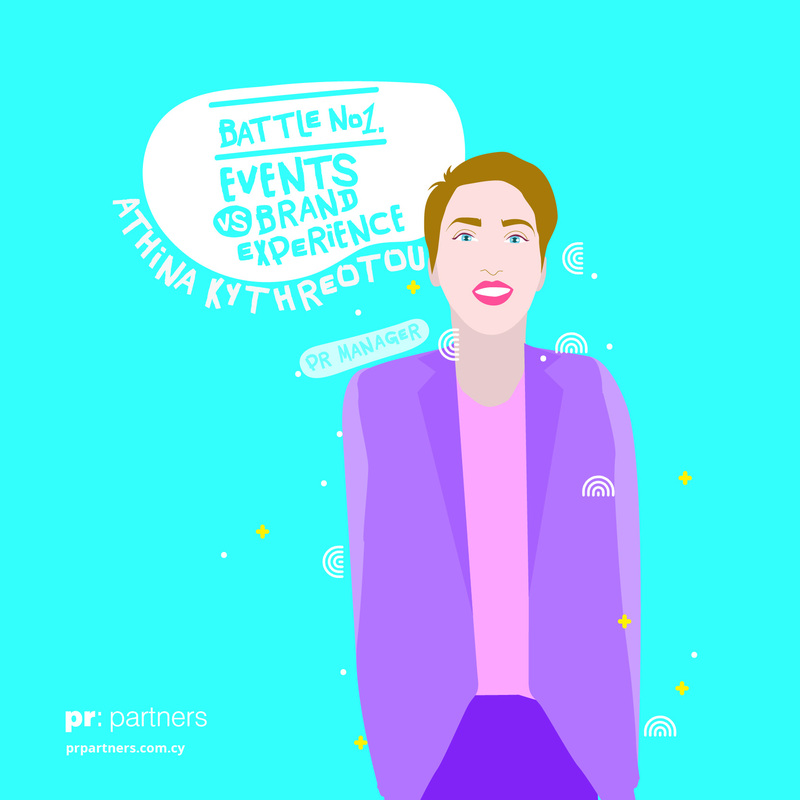 We define events as brand experiences that are targeted toward specific audiences. These can include promotions, interactions, meetings, trade shows, presentation and conferences with common interests that determine the theme and content of the event. Why do marketers and organizations run, sponsor or activate at events? Most events offer interaction and engagement with a brand, its people, products or services. And here comes the question? Are all PR agencies capable and experienced enough to offer this service successfully? How can you choose the right partner? In Cyprus, many companies can present their selves as ‘PR agencies’ and basically are just a press office sending out press releases, organise mini events such as christenings or make promotions in supermarkets. These are all very effective of course but are not public relations. Public relations are more than ribbons, ballons and flowers. The agency to choose is a one with a proven event experience. These types of experiences require a great deal of specific expertise, particularly on the production side. Most agencies with meaningful event implementation experience have a vast amount of pertinent information at their fingertips: venue specs for most of venues, along with all associates contacts, networking with the right people at the right place, working knowledge of local regulations and permitting requirements, etc. They know the rules of the game and all the possible scenarios. We think of experiential activations as more consumer-oriented experiences, often promotional in nature and geared toward more general audiences. So, if you are gonna do it, make it interesting! The difference is that often, experiential activations require a 360 degree approach and brand connection through a variety of channels (online, on site, before, during, after). Experiential activations must offer something that is memorable and unique. Something that people would love to share with their friends. Why? Because brands are built on physical and mental availability, and mental availability is built on memory. So who can be the great partner for this? It depends. Again an agency that has proven expertise is a must have. But you need to work with a team that produces great ideas, has the capability to deliver the best outcome of the project and the agency which will provide the most credible path to achieving your business objectives. And if you are going to proceed with a brand experience connection activity, you have to say it and publish it. The public relations agency needs to have the leverage, the status, the networking and the tools to maximize the exposure of any activity online and offline. As such, we often encourage our clients to offer people bold experiences, which are simple but emotionally engaging. We find that those types of brand experiences are much more memorable, and help deliver better return on their investments. So, it might be useful to think of brand experience as an umbrella term that describes a range of activities that include events, meetings, tradeshows, experiential activations, online competitions, social media activations, mobile applications and other meaningful interactions with brands and products. These activities are distinct from traditional advertising activities in that beyond creating awareness of a brand promise, these experiences are designed to deliver proof of a brand’s promise or the benefits of a product / service. Done well, brand experience can build valuable and lasting relationships with your brand. But they work much harder if they are truly extraordinary experiences. And when choosing a partner to help with your brand experiences, ask for proof of expertise in the area, not promises. Choose the one that will make it matter. For you.